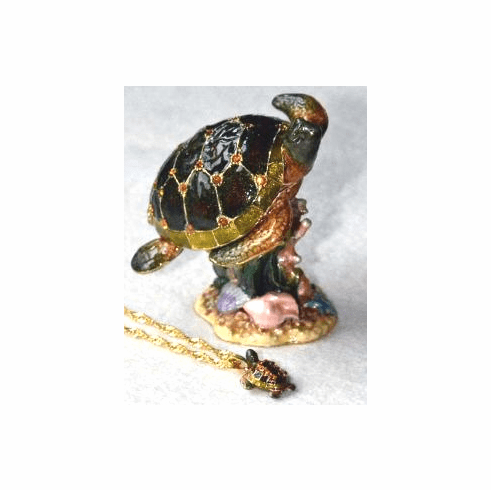 Sea Turtle Jewel Box w/Necklace, Set of 2 - Accented with 24 Austrian crystals that dazzle the eye, giving our Sea Turtle Jewel Box exceptional beauty and charm. Lift the turtle shell to reveal the hidden box containing a matching Sea Turtle Necklace adorned with 8 crystals on a 20" gold-plated chain. A treasure within a treasure, the jewel box measures 2-1/2" by 2-1/2", necklace measures 3/4". Gift Boxed.